There are times that I find it strange that my children will grow up not knowing what a cassette tape is, what it is like to have to watch television shows only when they are aired (and with commercials), and that it wasn't always possible to immediately get in touch with someone through email, text or by calling their cell phone. Also something I thought was a thing of the past? Wearing a watch. Why would I wear one if I can just glance at my phone to see the time instead? Add to that the somewhat-bland, generic appearance of all of my timepieces and it really isn't any wonder that they've all been relegated to the depths of my jewelry box. I'm now back to fully loving to wear a watch now that I have one that is modern, sustainable, efficient, simple, and distinctively beautiful. 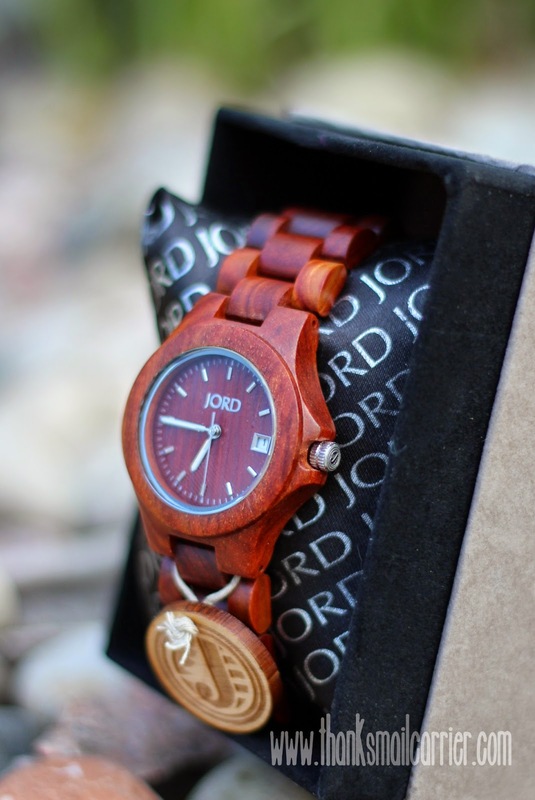 Basically, it's hard to not be in love with the amazing designs, intricate craftsmanship, and stunning appearance of the wooden watches from JORD! A locally owned, St. Louis based company, JORD believes that watches are more than timekeepers, they are statement pieces. As watches speak to the style and personality of the wearer, why not select one (or give one as an amazing gift) that has the ability to tell more about you than just knowing the time? 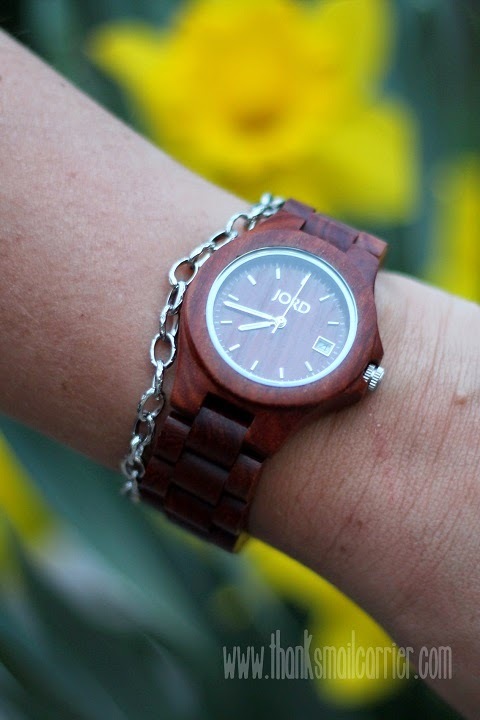 I have to admit that in a you had me at hello type of way, I was head over heels with the JORD wood watches as soon as I visited their website. From simple to complex, their 100% natural men's and women's watches are so unlike any that I have seen before that it didn't seem possible to select a favorite. 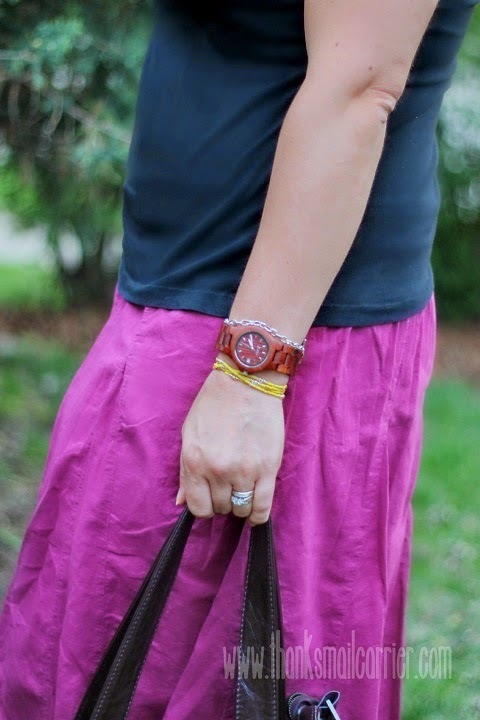 However, once the Ely in Cherry arrived, I knew that it was absolutely the perfect combination of understated, effortless elegance mixed with just enough of a punch of color to keep my interest. The Ely is available in four color options — Maple, Black, Natural Green & Maple, and the Cherry that I received — and its uncluttered, clean design truly shows off the spectacular grain of the wood and the overall quality that JORD stands behind. One aspect of this watch that I liked in particular is the slightly smaller dial and band (in comparison with the rest of JORD's collections) and the recent addition of the date display. I find that I never know the date, so having it right on my wrist has proved to be a big convenience that I hadn't realized I needed! 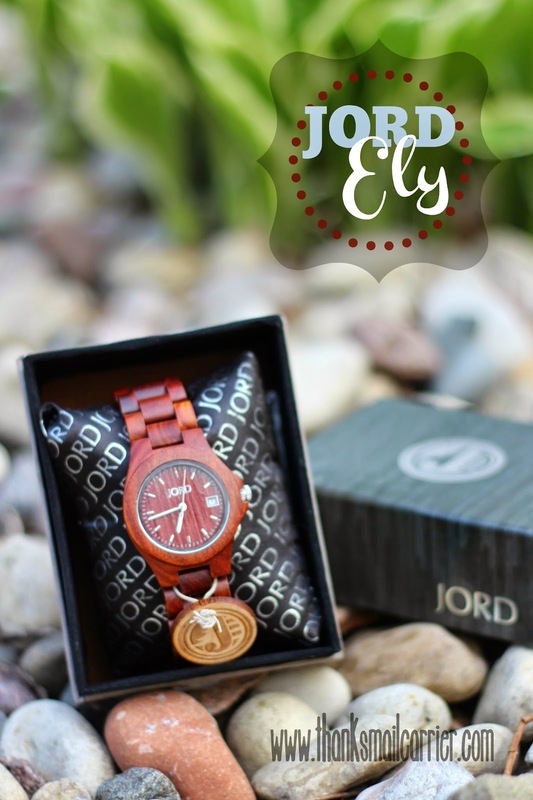 As the icing on the cake to the stunning looks and impeccable quality of this JORD wood watch, the company offers complimentary sizing with each order. Forget having to find a jeweler (not to mention spare time) to have links removed, you simply measure your wrist beforehand and, upon arrival, your JORD watch fits perfectly right out of the box! And once you have this on, it doesn't take long to realize that JORD watches go with everything! The sleek, polished look can easily pair with a dressier outfit; perfectly accessorize a pair of spring capris and a blouse; give a finished appearance to jeans and a tee; and more! Alone on your wrist or paired with bangles, bracelets and more, a wooden watch just might be the thing to take your everyday wardrobe to the next level... while keeping you on time as well! I couldn't be much happier with the style, design, quality, lightweight feel, and sustainable nature that JORD has provided in my life! 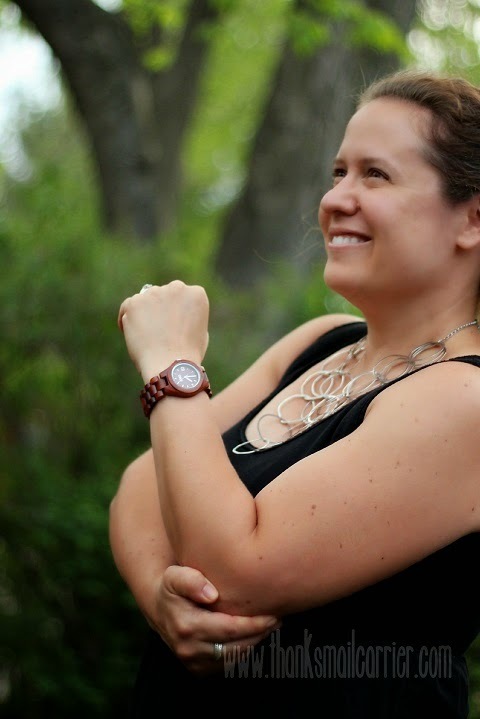 Find out much more about their wide variety of striking styles of men's and women's watches by visiting WoodWatches.com and connecting with them on Facebook, Twitter and Instagram. Other than the Ely Cherry watch that I was provided by JORD in order to facilitate my review, I was not compensated or enticed to do this post in any way. This review is solely my honest opinion about this incredible product. That is a beautiful watch. (I have one, too!) I think that we should all be wearing analog watches. Everyone should know how to tell time. I still tend to wear watches. I love the idea of a wood one. They are very pretty! I have a Jord watch, or should I say had. My husband saw it, loved it and claimed it as his own. It looks good on him, though, so I let it slide. Gorgeous photos! Thank you so much for the lovely post! We have one of these. I gave one to my hubby last year. He LOVES it! He wears it just about every day! They are great watches! I love the looks of that watch! It's so beautifully unique. I've been looking for a quality watch. I'll have to check their site out. These are such cool looking watches. I've been trying to get the hubby to wear a watch for years and this just might be the thing to convince him! My husband wears his JORD watch all the time - hes begging to add more to his collection too. I haven't worn a watch in years, but it'd be nice to know what time it is without getting sucked into all of the notifications on my phone. I love the look of this watch. The wood is so cool! These wooden watches are beautiful. It is about the only reson I would wear a watch at all. I love Jord Wood Watches! My husband has one! Its such a statement piece! My husband has a Jord watch and he loves it! He gets so many compliments on it. They have some really unique wood watches I love the Cora Series watch and the and Sidney style! These are amazing!!!!! My roommate bought one of these for her boyfriend and he loves it!!! It looks really nice! And a perfect gift for mothers day. Just told my boyfriend to get one of these for my birthday! And I am not even a watch person! They really do have an nice quality. I got one for my FIL for Father's Day awhile back and he still loves it. Nice looking watch! I love collecting watches and wouldn't mind having one of those. I have a Jord watch and I absolutely love it. probably one of my favorites. I really want t Jord watch! It's gorgeous and I love that it is made of wood and compliments every style. I have a Jord watch. It it such much cooler in person.